It was the broccoli pesto that was the troublemaker, I just couldn't make it look good with sweet potatoes. It looks fine with regular potatoes, I think! Actually if you want to know, it was the good amount of almond milk that finally pulled this recipe all together; the pesto needed to be well thinned out to layer nicely between the potatoes and more for the top to keep it from drying out. And also it makes the broccoli a prettier shade of green, not quite so Halloween green. So question, how I am able to divide all the potato slices evenly into five layers? And the answer is, I don't. I always have leftover slices, and what do I do with them? Welp, you can throw them out. Just saying! I only bring this up because if cooking—or anything, really—frustrates you, it might be because you're unconsciously trying to do the thing more perfectly than it needs to be done, and the more you can make conscious that things don't have to be perfect and that waste happens, the more you can relax into doing things and actually doing them well. Nin said the other day that she would like to know how to cut up a mango without wasting so much, and really the thing to know is that you always waste some mango and then you can accept that and enjoy the mango you get. 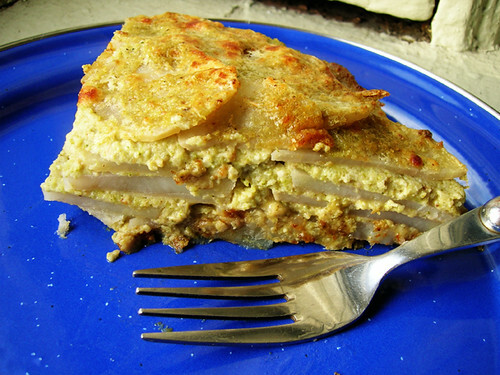 Anyway what I actually did was throw together the extra potato slices and the extra sweet potato slices from last week's gratin with the little bit of leftover pesto into a cake pan, and it was ugly but good. Bring water to a boil over high heat in a large saucepan. Add broccoli and cook until tender, about five minutes. Drain. Put the broccoli, garlic, walnuts, parmesan cheese and nutmeg into a food processor and process until roughly chopped. Add the almond milk and process until incorporated. Peel and slice the potatoes very thinly. Melt some butter in the microwave and get your brush. First brush your ovenproof skillet with butter, then lay down a layer of potatoes and brush them with butter. Spread some broccoli pesto over the buttered potatoes, not too thick. Lay down another layer of potatoes, brush with butter, and spread with pesto, you do this three more times. After the fifth layer of potatoes though, you should have just a little bit of pesto left. Mix that with whatever butter's leftover and a bit more almond milk and brush that all over the top layer, then sprinkle over a final layer of parmesan cheese. Bake for forty minutes until the top is golden brown and the potatoes are very tender when poked with a fork. Let cool a bit before slicing, then the slices come out better.